50 clear Asfour lead crystal prisms. Each one is a 50mm French cut. Tiny hole at the top for hanging. 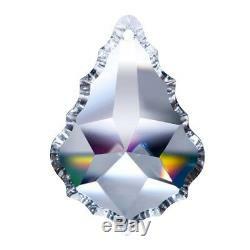 100% guaranteed AUTHENTIC Asfour Lead crystal prisms. Asfour is one of the leading crystal manufacturers in the world. These are top quality 30% lead crystal prisms. WE ARE AN AUTHORIZED DEALER OF ASFOUR CRYSTAL. We sell matching octagons, chandelier pins, and magnets to hang prisms in separate listings. Our crystals are perfect for wedding decor, jewelry making supplies, crystal windchimes, chandeliers, suncatchers. We have the largest selection of chandelier crystals in the US. The item "50 Clear 50mm French Cut Chandelier Crystals Asfour Lead Crystal Prisms" is in sale since Monday, July 31, 2017. This item is in the category "Collectibles\Lamps, Lighting\Lamp Repair, Refurbishing\Prisms". The seller is "ctpickers" and is located in Bethlehem, Connecticut. This item can be shipped to United States.